Disclaimer: this review is *not sponsored in any way* – I paid for a series of Blue Apron meals with my own hard earned moolah, and the giveaway is sponsored by me! After several months of ordering Blue Apron boxes, I thought it would finally be appropriate to hop onto the Second Lunch and share with you a detailed review, organized in an FAQ format (warning, it’s long). TL; dr: I’d recommend Blue Apron if you are interested in a meal kit, with reservations that I’ll get into below. A friend gave me a free week of meals, and I rarely turn down free food. It’s *very* easy to sign up for the service, and they have a great acquisition model that allows you to give your friends free meals after you’ve ordered a few boxes. I got a new puppy who dislikes alone time, and didn’t have the bandwidth to do my preferred daily shopping – I actually love going to the store, but needed another practical option for last minute meals that wasn’t delivery. I was interested in seeing if my partner would enjoy cooking if I were to step out of the kitchen and let him do his thing with the Blue Apron directions // or if this could be something that we’d enjoy doing together. My obsessive love of food can be exhausting. Sometimes food needs to well, just be food…A meal kit where someone else chooses the recipes and buys the food for me is startlingly refreshing. There are many meal kits on the market, but Blue Apron is one of the more established ones – they were on the ground early, consistently iterated on their product, and have added features such as wine pairings, a well-curated store (overpriced, but great for ideas! ), and cookbooks. They also have a particularly well designed app AND web app. With a 2 billion dollar valuation, $135 million in their series D funding, Blue Apron is likely to be on the scene for the long term. I’ve tried a handful of different services, and I’d definitely consider trying more – maybe you’ll get a little series here in the future? Noted competitors include: Plated, Hello Fresh, and the vegetarian Purple Carrot – now with Mark Bittman on board. This space isn’t a surefire bet for a new startup – the logistics of operations are challenging. There are equally as many companies who have started a box and shut their doors. What kind of meals does Blue Apron provide? 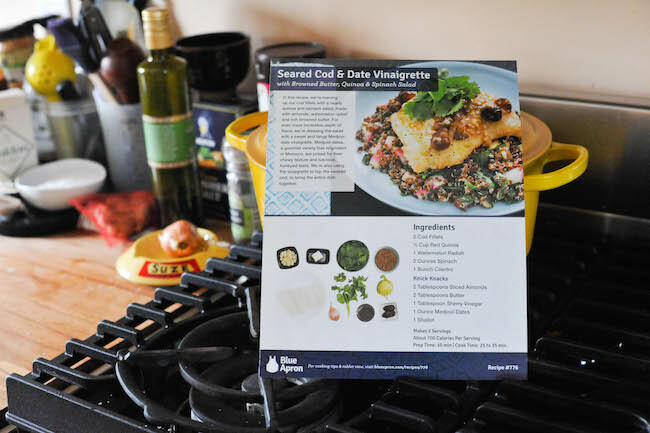 Blue Apron is an omnivorous box – with options for vegetarian meals – although their strengths (in my opinion) are their non-vegetarian dishes. They source wild caught seafood, organic meats when possible. Our favorites have overwhelmingly been meat- and fish-based. Yup, that’s a lot of cod! What if I am… vegetarian? Gluten Free? Dairy Free? What if I hate fish? Well, you are sort of out of luck. I think this is the biggest reason not to order the service – while the omnivorous meals are usually delicious, most of the vegetarian dinners have been overwhelming duds for us. They don’t currently offer gluten-free options or dairy free options, although for a dairy free (or Paleo) eater, I have found that the recipes are often relatively customizable to eliminate dairy and obvious gluten. They don’t have a specific paleo option, but if you are willing to make some concessions, you could still order the kits. Are Blue Apron meals healthy? Generally speaking, they fit well into a whole foods focused lifestyle. The meals are relatively well balanced, and most come in at about 700 calories a serving. I usually find these to be ample portions to satisfy my (voracious) appetite, but I do feel that many are lacking in green vegetables. I’ll often supplement with my own extra vegetables. How flexible is the service? How far in advance do you have to order? Can you cancel Blue Apron easily? Put deliveries on hold? This has been a big bonus for us – you can fairly easily pause and unpause the service without being charged. You get charged when it ships. There have been multiple occasions where I’ve decided to hold off on a kit, and even unpause when I’ve changed my mind close to the cut-off. There are clear cut-offs on the website (and app) for the changeable by date. Tell me more about their web and app! 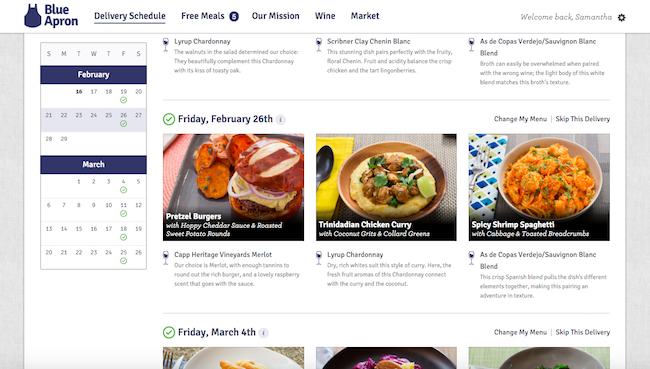 One of the strengths of Blue Apron is a well designed app and web app. Believe me, it’s really easy to do one well, and one poorly – but the company has an overarching UX that is consistent through app and web. I actually didn’t download the app until about a month or so after consistently getting kits – and I ended up using both. Once you make your meals, you have the option to rate the recipes on a five star scale, which you can do from phone or web. On web, you can also see the comments of other subscribers who have cooked the dishes. I’ve found that this has been useful to pre-emptively tweak a recipe if the crowd suggests something might be off. 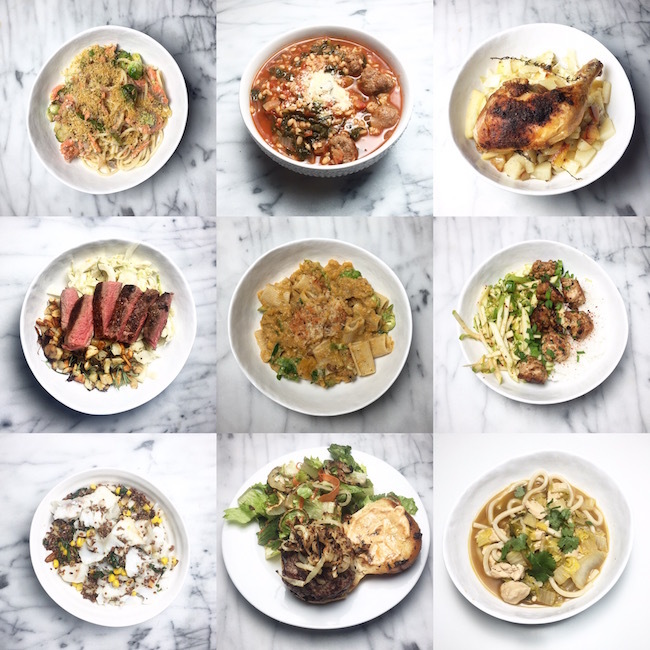 As a subscriber, in addition to the boxes, the Blue Apron app has a great archive of previous recipes you have access to. You can access these from web, but the app has a searchable gallery that is easier to access. I’ve actually found myself on the phone app at the grocery store recreating some of our favorite meals with the convenience of a recipe in hand. This alone has been useful for last minute grocery shopping. 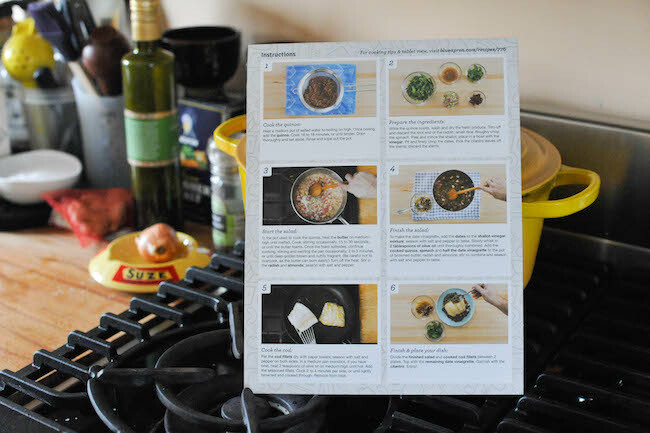 I’ve spent a good amount of time testing recipes professionally, and used to manage a cookbook store – the written and visual instructions on the recipe handouts are well designed and useful. They have clear notes about ingredients and steps. Flavor, and recipe success has been another story. They excel at certain meals, and not at others. The dishes inspired by global cuisines tend to have shortcuts and fall a little flat, and I haven’t been wowed by any of the vegetarian recipes that I’ve tried. There have also been meals where the time recommendations have been woefully off – cooking root vegetables comes to mind. At the end of the day, the boxes seem to be somewhere between a 60-80 percent success hit rate for me, and I have only flat out disliked a few dishes. This is actually good enough for me to order the kit again. I know if something seems like it might really be a dud, I can always riff off of the box ingredients. If you have very high expectations, or are completely tied to a recipe at all costs, you might steer clear. How much chopping is there, really? So. Much. Chopping. My typical home cooked meals take 15-20 minutes at most, usually the length of time it takes to cook my protein. With Blue Apron, I find myself routinely spending 35-50 minutes cooking, and I’m not sure that the results match. That said, I’ve found that cooking these meals have actually encouraged me to branch out with my other meals. I’ve become much more likely to take a little bit extra time to prep. Maybe. The kits end up coming to $60 for three meals for two people. There are larger family-size kits as well. $20 dollars a meal would be high if I were trying to seriously budget for our food, but actually can be lower than if I were to head to the store before dinner to purchase meal ingredients – and end up with the ten other items mysteriously in my cart. It’s a decent price for the meals with organic meat or wild seafood, but strikes me as high for the vegetarian dishes. (Although Kenji’s recent post makes me consider my own biases about the cost of vegetarian dishes). What about the quality of ingredients? Generally speaking, there have been good quality ingredients – decent welfare meats, wild seafood, and good produce. The produce is not all organic – which is something I typically strive for in my own purchasing, but the quality has been consistent, and I like when they source from smaller scale farms. Does Blue Apron really create a huge amount of trash? 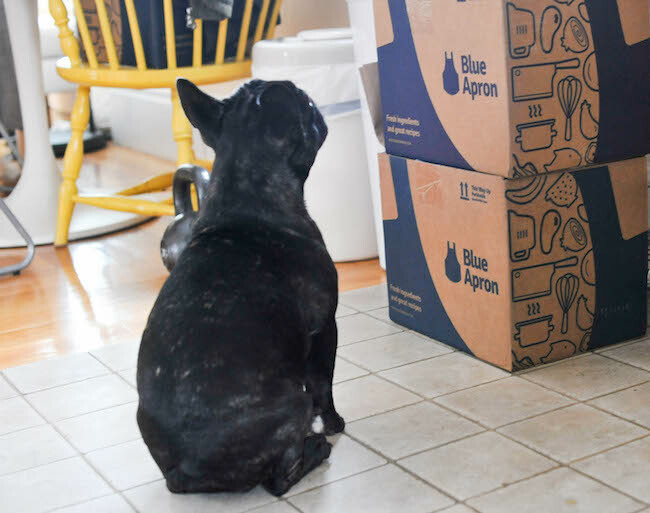 Blue Apron does have a recycling program – if you regularly order boxes, you can save them up and then send the recycling back. I have yet to use it, because it still seems like a PITA. The biggest problem for me is keeping up with the larger recycling – the cardboard boxes are annoying to break down, and there are big ice packs which you could purportedly empty into the sink, but I feel highly uneasy dumping the gel down the drain. Can anyone cook a Blue Apron meal? I do think that the instructions are usually clear enough that anyone can make a go. That said, there have been several meals where the instructions have been woefully off or simply did *not* work for me – I’m an accomplished cook, but the first time I made a bechamel (according to their instructions, not my experience), the flour completely clumped and then the sauce weirdly broke. I laughed it off, went back to my fridge, and made my own version successfully, but I could see this being completely demoralizing and anxiety inducing for a novice cook. Other times I’ve noted that the cook time has been significantly less than needed – be it for cooking onions, roasting potatoes, or cooking squash on the stovetop. I do find that I’ve had to seriously amend seasoning to my own taste at times – I’ve ended up playing a sort of “Chopped Blue Apron” game for several of the meals. What are some of the problems with Blue Apron? Not enough green vegetables. I find myself consistently supplementing our Blue Apron dinners with more vegetables. There are never enough greens for me. Please, please give us more vegetables. So..many.. onions. I like onions, but I find the recipes to be supremely onion heavy. I reduce to my taste, usually by about half. On the plus side this means I never have to buy onions or garlic, because I always have surplus? Vegetable spoilage. Like with any delivery service, I’ve had ingredients that were at the end of their prime, but generally speaking this hasn’t been too much of an issue. Occasionally the sauces/liquids are put in containers that might be sub-optimal, and I did have a tamarind paste explosion in one kit that ended up making a serious mess. How is Blue Apron’s customer service? On that note (the tamarind explosion), I found that customer service was generally helpful – I emailed asking what brand/type they used so I could get the proper replacement at the store, or figure out a substitute. While they didn’t email me back immediately, when they did, they not only provided a helpful suggestion, but did give me credit for the meal. Who else is cooking Blue Apron? One thing I was really surprised to find out is how many of my friends were cooking with the service. I started to notice familiar dishes on social media. 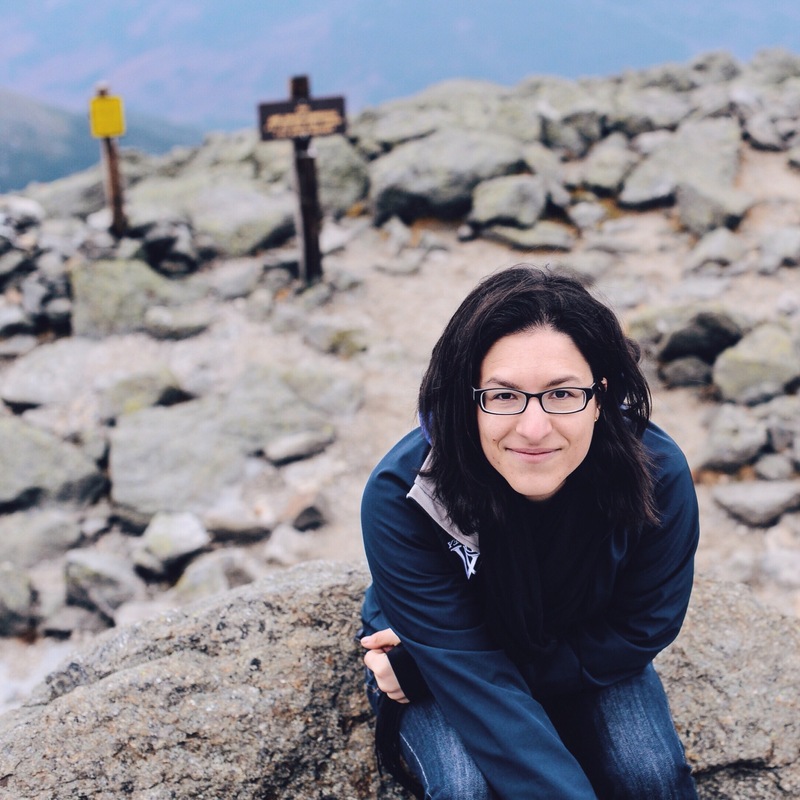 This might not be odd, but my general group of friends includes quite a few food professionals who were using Blue Apron – quelling some of the general shame I had around using the service. I’m someone who makes recipes, meal plans, and has been in the industry. But so are they! And now some final personal thoughts…. I’m likely not the target market for Blue Apron or any meal planning kit – or maybe I am? I like cooking, I’m interested in trying new meals. I have a busy schedule and like the convenience of the service. The real benefit to me? Someone has taken the choice out of three of my meals for the week (when you dream of food all day long, sometimes the hardest part is simply choosing something), and there is definite convenience to having the ingredients show up on my doorstep. You’ve made it to the end! 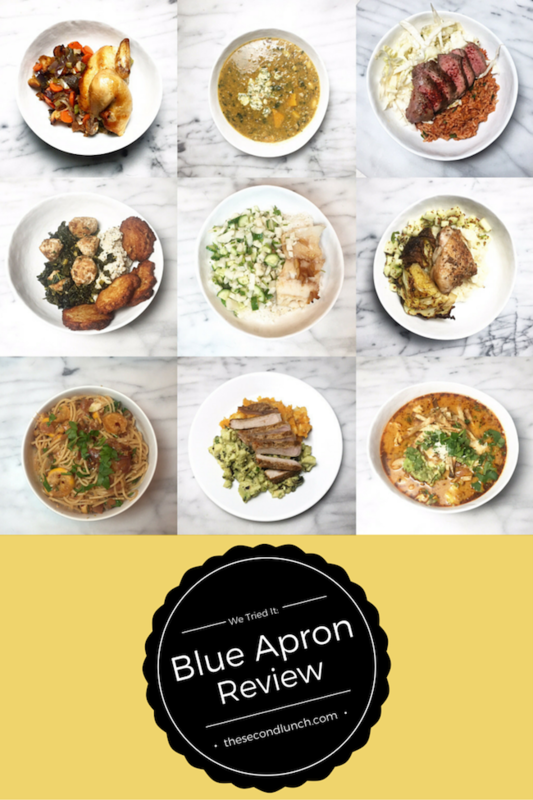 If you are interested in winning a FREE Blue Apron delivery, I’m giving two lucky readers a chance to win! To enter, simply comment below (let me know either a) why you want to win, or b) if you have any questions about the service) by 4/1/16, and I’ll use a random number generator to pick two lucky folks! I’ve been meaning to try Blue Apron for a long time now. The recipes always sound delicious. Thanks for writing such an honest review, it’s nice to hear the downfalls as well as the good! I think this post convinced me to try some Blue Apron meals in April, when our schedules get busy, but not every night is a grilling night! Hope to see you soon! Thanks for this review, Sam! I gave a gift of Blue Apron to a friend who recently had a baby, and I hoped it was a good choice. Sounds like it probably worked out great for her! I have been curious about blue apron even though I love to cook and we typically cook most our dinners at home. That being said- I often get into meal ruts and my family would appreciate some variety! I’ve been curious about it, but not sure if the kids would go for most of the meals I’ve seen. My meals are very family-friendly. I think generally speaking these might be a stretch flavor wise for a picky kid – although my slightly picky partner likes most of them! You can pick and choose the ones that would be most appealing each delivery. I’ve been curious about trying Blue Apron for a while now, so really good to see such a thorough review! I’d love to win so that I could try it out! I would like to try a meal service like this to try different recipes for my family and for convenience. I agree with many of your points–especially about the lack of green veggies–and have plans to write a similar unsponsored post. Nice, thorough review! Wow, what a detailed review. I tried a similar shipment 2 yeas ago. I’d like to give Blue Apron a try. Great read! I have been wondering about this program for a while but haven’t tried it yet. I am wondering how kid friendly it would be. My daughter loves food and cooking so I think it would be fun to do it together. I’ve wanted to try this for the longest time! And I need to expand my recipe pallet a bit. Fingers crossed on the give away. Thanks for the detailed debrief. I’ve always wanted to try this but was unsure if the meals were substanial enough. I had nightmares of creating a meal and then having to order out to finish up. Hey! Really glad you wrote about your experience. I’ve used a SF-based meal kit service and found the meal portions enough for dinner and leftovers – found it way more fun riffing off the remaining ingredients! Do you and D have leftovers after the meal? Curious being a single person household! I’m interested in trying this because I like coming but don’t always feel inspired about meal planning. Also my husband and I are trying to eat out less. I’m hesitant because: 1. No leftovers for lunch and 2. I don’t eat beef or pork. Thanks for the review! Cannot agree more! I recently tried 4 weeks of Blue Apron as part of the experience of living in temporary corporate housing without a real pantry. The fact someone has planned the entire week’s menu for me is the biggest draw. I used to eat the same things at least 2 times a week… However, I found myself wanting more greens, more flavor, and LESS calories per meal! The experience made me search for a meal planning app instead. Coincidentally, Gilt City SF is offering a discount on Gatheredtable, the subscription based meal planning app backed by Starbucks CEO. I may actually give that a try now that we are moving into our own apartment and will have our pantry stables back in my hands! I just got my first box today. Excited to give it a try! I’m a little worried about all the prep work, since I’m tired by the end of the day, but I’m looking forward to trying the dinners. This was an interesting read as I am considering getting my sister a gift card subscription for Blu Apron for her birthday. Blu Apron suggest a gift card purchase of $120. I’m wondering if that would equal X number of meals?? Thank you!